Kubota Z482 Engine - Low compression. Just scored a Kubota Z482 engine from a scrapped lorry refrigeration unit in the middle of a massive junk pile. Unknown running hours as the control unit was computerised and didnt have an hour counter that could be read without the whole thing powered up and running and there were also bits missing. The only info I have on its condition was the single comment "They usually remove the engines before I get them, so best of luck starting it! ", he had several refrigerated units all with engines removed except this one. After I told him it was a non-goer with low compression and probably totally knackered he appeared unconcerned about its cash value as I gave him the £250ish I owed him for the use of his land for the weekend and we went our separate ways. Have there been any successful conversions with the Kubota Z482 before I go spending time and effort repairing the engine. ?? I'm also having trouble tracking down any info other then the basic engine spec. I also hit a blank wall getting info for a Z400 from Kubota as they don't hold info on engines that old so if anyone has a manual can I have a copy please. Re: Kubota Z482 Engine - Low compression. with Kubota engines available, but I don't know if they are still active. I've recovered the engine back to my house and had a tinker. And all was going so well, well sort of. After an entire evening of riding in the heavy rain I fetched the Z482 from a friends house where it had been nesting under a garden table wrapped up in a WWII tent carry bag and a blue tarp. It was a round trip of some 150 miles and it rained for much of it. Here it is in the spare room of my house. There are no photos of it on the new trailer (with mudguards) because of the wet and dark. The main problem starting it was low compression and after turning it by hand and putting my ear over the inlet and outlet manifolds I concluded it was the valves leaking which leaves very little options other then whipping the head off ASAP. First was the rocker cover. Then the head. It was simple enough and everything was not seized solid or rusted away. There was some loose debris in the combustion chamber and after removing the valves I could see they were very worn but still serviceable with a bit of lapping in. I'll do this my self because if I go to a head shop they will nag me to buy it new valves which I'd rather avoid until the engine has proved its self reliabable. If you look at the top left corner of the above image you'll see the crank end of the old R80 engine and if you're paying attention you'll spot the remarkably similar bolt pattern. This required immediate investigation and after removing the flywheel I started getting excited. Just look at the BMW flywheel washer top centre of the above photo. I then placed the R80 flywheel over the Kubota flywheel and the bolt holes lined up and were indeed the exactly same. It really does fit!! A truly simple bolt on clutch adaptation procedure. Well I'll have to lathe some of the original flywheel away because there is a simple recess (the bolts only have about two threads engaged at the moment) and also remove the redundant BMW ring gear but that's trivial. The important thing to note is that the BMW clutch will then bolt into the additional flywheel. I cant do away with the original flywheel as the extra mass is needed to spin the diesel engine over compression. I will however be removing the weight of the BMW flywheel + clutch bits from the Kubota flywheel when its in the lathe. So to finish the gearbox adaptor all I'll have to do is make a gearbox mounting flange and weld spacers in-between it and the convenient 6mm plate the starter motor is bolted to. At most a good weekends work only leaving fitting it into the frame which is a big but hardly a technical job. Then whilst turning the crank to-and-fro looking at the two flywheels I became aware of a chonking sound. Then after some more thought and careful flywheel moving I concluded the big end (or little end) bearing of the rear piston was damaged as it allows about 1mm of flywheel rotation before the 'chonk' and the piston starting to move. Guess its scrap unless someone can convince me to continue and rebuild it (for cheap). I think this will require more than a slug jamming into the gap. I've taken it right apart now. Gerrt big oversized thing held about 6 litres of oil that went all over the floor after I tried to pour it into a gallon can. Taking the massive sump off was not that difficult. The snobs of gasket goo suggest I'm not the first to open it up! There we have it, a knackered big end that needs a regrind. The photo gives it no credit to how scored the metal is. That's me on the phone all Monday morning finding how much a regrind it. Sorry about your tale of woe. I mated a Kubota d950 to a bmw clutch and orriginally thought the holes matched, only to find that one of the Kubota holes is asymetric (easily fixed with a bt of filing of the clutch). After a closer examination one of the BMW holes is asymetric but not as asymetric as the Kubota. Some filing will be necessary. Thanks for the heads-up on that one it could have caused a real headache when doing the final alignment checks. go with it! i think it will give a smooth ride! 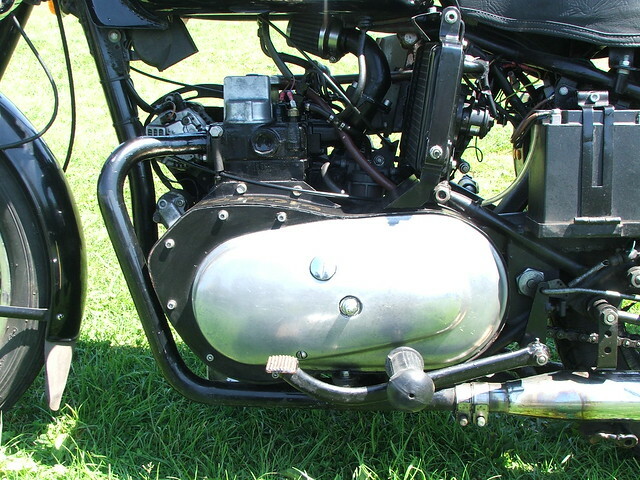 it must be great in an enfield, although the water cooled engien will be much heavier then the noisy airheads?? For those of you interested this is the most recent engine report from my shed of doom. The rebuilt Kubota on its first start since the crank rebuild. What kind of bike will you build with this engine? How radical will this be? Here is one of the other Kubota-Bikes. Can't wait to see how your build will look like! zarquon wrote: Here is one of the other Kubota-Bikes. Thanks. That photo has answered the burning question I had which was how small a battery can I get away with. Rather small would be the answer. zarquon wrote: Can't wait to see how your build will look like! Mouse wrote: Thanks. That photo has answered the burning question I had which was how small a battery can I get away with. Rather small would be the answer. You are already under observation. Now i am struggling to get a good head for my chinadiesel(head rupture0 i am thinking more and more about a build like this. I have some questions about the engine and build in. 1 isn't it much heavier, too heavy for the enfield frame? 2 is it hard to ge it adjusted to max. power and 3600rpm? 3 is building a -frame supporting- subframe difficult for the bike to ge the engine fit? 4 do you need a longer gearbox shaft? i suppose so because of the width of the engine? 5 how smooth does it run? and how fast cruising?? arnaud wrote: 1 isn't it much heavier, too heavy for the enfield frame? arnaud wrote: 2 is it hard to ge it adjusted to max. power and 3600rpm? Not sure about power adjusting but the max and min rpm adjusters are easily tweaked. Or are you talking about the throttle linkage for max min? arnaud wrote: 3 is building a -frame supporting- subframe difficult for the bike to ge the engine fit? Yes, There is only 2mm clearance between the frame and engine at about three points. It would be easy but I decided to not cut or adapt the frame to make it truly a bolt-in conversion. If I were not constrained by a clean frame build then it would be a lot easier. arnaud wrote: 4 do you need a longer gearbox shaft? i suppose so because of the width of the engine? No. I use the standard BMW R series gearbox and clutch but modify the flywheel to take the clutch unit. This is the sort of thing you'd have to send off to a competent machine shop (And get the dimensions right for them) unless you have access to reasonably large lathe and can use it. arnaud wrote: 5 how smooth does it run? and how fast cruising?? Very smooth, no handle bar vibrations when running and a very stable tickover. Cruising about 55-60 mph and it maxes out at about 65-66mph which is all you're feasibly going to get from the available power which is good as you're limited with the available gear ratios. This is a cruising at 55+mph not a max speed of 55mph like the inferior Enfields. 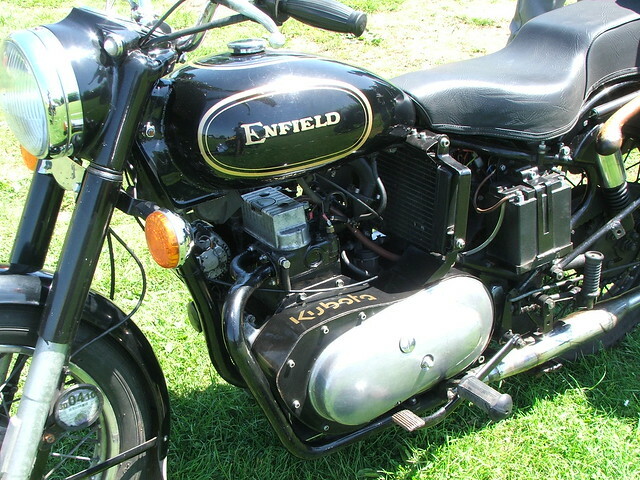 It is comfortable to take on the motorway unlike the two different single cylinder Enfields I've ridden which were just slow enough to be death traps in busy traffic. thanks for the reply, i am making small/future plans to build one in an enfield..
the 10hp chinadiesel will take it to 100k/m, but brakes are more important.